The goal of Montessori education is to develop to the fullest the three aspects of the child’s nature body, mind, and spirit. Learning music happily involves all three of these dimensions and can, therefore, be a highly integrating force in the development of the child’s personality. Music-making involves a physical activity (moving, singing, playing), produced by mental direction (matching a pitch or rhythmic pattern), to convey a sentiment or idea (a manifestation of the spirit). Parents who sing and dance with their children are giving them the message that music-making is a natural, daily activity a tonic for the body, mind, and spirit. When the child enters a Montessori pre-school environment, the use of music as a spontaneous expression continues, and the teacher gradually introduces the elements of music in a more structured way. Rhythm: Beginning with walking on a line and progressing to other natural expressions of movement, such as running, skipping and galloping, the child begins to associate certain rhythmic figures with bodily movements. Also, through the use of echoes, both verbal and rhythmic (clapping, tapping knees, snapping), children acquire a vocabulary of simple rhythms. Pitch: Through daily singing of songs, nursery rhymes and finger plays, children begin to acquire a sense of pitch. The Montessori bell material affords the child the opportunity to hear musical sounds in isolation to match, grade, and name them. Work with both the pentatonic and diatonic scale patterns gives exposure to different pitch relationships, which are the building blocks of melody. Timbre: Children are introduced to the instruments of the orchestra, with their various tone qualities, and learn the names of the instruments and their respective sounds. Intensity: Children hear pieces with different gradations of volume a quiet lullaby, a strong march. 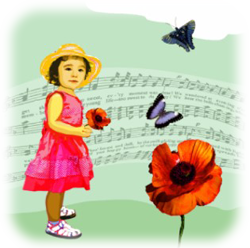 Form: Children realize through listening to selected music that there is a form to music, just as there is a form (syntax) to language. Culture: As teachers introduce music, whether vocal or instrumental, its place and time of origin is given so children begin to relate music to history and geography.